BigTimeFootballs.com is proud to offer this EXCLUSIVE commemorative football honoring one of the NFL's greatest quarterbacks. 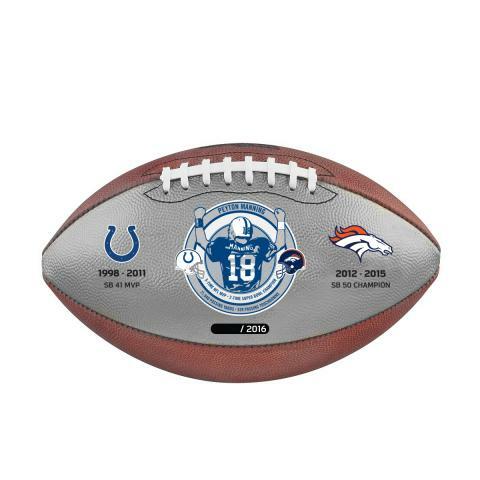 This is a Limited Edition Wilson Pro Model Game Ball featuring a commemorative panel honoring Peyton Manning. This colorful panel features a Manning silhouette, his career stats, awards & achievements and logos of the two teams for which he played - the Colts and the Broncos. This Wilson football is the same model as the ball used in all NFL games, including the playoffs and Super Bowl, but with the special commemorative panel. Fans of both the Colts and Broncos, as well as football fans across the country will move quickly to add this limited edition ball to their collection. It is the ideal collectible honoring one of the game's finest leaders. Order yours before they are gone. Due to the limited nature of this item we must charge your credit card for the full price immediately upon taking your order. This policy ensures we reserve a ball for you. We will confirm your order by Email. This ball is not game used.